In Missouri, the drivers license renewal process is developed for residents to continue holding permits in the state. Specific methods for the DMV license renewal procedure are instated at the convenience of drivers. Applicants must meet eligibility standards in order to be issued updated permit cards. These requirements confirm the safety and driving ability of MO residents. Additionally, drivers must obtain new permit cards by the state-issued expiration date. Permit renewal is a required process that differs from license replacement. Unlike license renewal, replacement should only occur when license cards are stolen, lost, damaged or contain incorrect information. With prior research and preparation, drivers living in Missouri can easily renew their driving privileges. Consider the following information to discover additional info about obtaining updated driver permits in the state. Note: Drivers trying to locate the expiration date on their drivers license can find it located on the upper right hand side, directly above their date of birth. Be renewing a regular license. Already hold a valid drivers license. When Missouri residency proof is presented to drivers license offices, P.O. boxes cannot be submitted. Alternatively, only permanent addresses can be provided to meet state verification standards. Lastly, only official documents can be presented in order to meet state eligibility standards. Missouri drivers with outstanding legal violations are unable to renew their licenses in the state. For example, applicants who have parking or traffic tickets on file cannot obtain updated permits. Drivers license renewal forms can be submitted when all tickets and fines are paid by residents. Drivers with suspended or revoked license privileges are also ineligible to obtain updated permits. How Early Can You Renew Your Drivers License in Missouri? 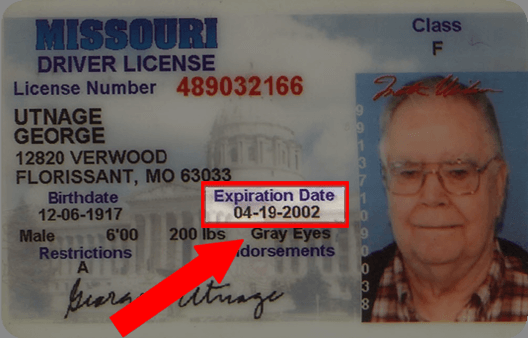 In Missouri, residents can renew DMV licenses up to 6 months before the official expiration date on a permit card. Drivers who anticipate being out of town or busy closer to their license expiration date can take advantage of the early renewal standards. Renewing a license after the expiration date does not incur late fees. However, drivers cannot legally operate vehicles with expired licenses. Learning the most effective way to apply for DMV drivers license renewal helps drivers to obtain updated licenses more easily. In Missouri, only one method for renewing licenses is available to residents. Applicants can prepare for their in-person visit by learning what is needed to renew drivers licenses in the state. Next, drivers can collect the required documents and fees before visiting a licensing office. For Missouri drivers wondering, “Where can I renew my drivers license in person?” residents can find multiple official licensing locations throughout the state. These offices provide renewal services to eligible drivers. When the nearest license office is located, residents can prepare to visit the location by gathering required documents in advance. Drivers license renewal requests, verification documents and fees should be collected beforehand. When visiting a licensing location, applicants must provide accurate and up-to-date personal information for renewal. Next, documents verifying Social Security Number (SSN) and MO residency should be provided. If necessary, vision, driving and/or road sign tests are administered. Drivers should keep in mind that credit and debit card transactions may garner additional processing fees. When submitted requests, fees and documents are approved, updated licenses are mailed to drivers. Military members who are Missouri residents are subject to similar drivers license renewal requirements are regular applicants. However, active duty service members are given a special grace period for license renewal. These drivers have up to 60 days after being discharged to update their driving privileges in the state. REAL ID drivers licenses are specialized documents that allow drivers to access federal buildings, fly domestically and more. While MO currently does not offer these types of permits to residents, REAL IDs will be available to drivers in the near future. When this type of license becomes available, applicants will be required to provide additional verification documents to renew licenses. Drivers should keep in mind that all credit and debit card transactions for renewal are subject to additional fees. The total convenience fee applied for transactions up to $50 is $1.25.